Published in the Dover Express, 24 April, 1981. In its early days this church had very little that was valuable attached to it. In the inventory of goods in Kentish churches, made in the year 1552, there was no report from Buckland. The plate, prior to 1874, consisted of a plain cup and a silver salver, bearing the date of 1828. In 1874, for the service of the Communion, Mr B. Hesketh Jones presented a cup, 6i inches high, weighing 10 ounces, a flagon 9 inches high, weighing 14 ounces, a paten 5½ inches in diameter, weighing 5i ounces, on the occasion of his silver wedding. There is a second cup, purchased by special offerings, in 1882. 6½ inches high, and weighing 9½ ounces. At the back of the foot of it is a cluster of diamonds, especially given for that purpose by a parishioner, in whose family it was an heirloom; and on the front of the foot is an engraved representation of the Crucifixion. The accompanying paten weighs 3½ ounces, and, with a small silver bread box, is fitted in a leather case, for the Communion of the sick. It was in 1874 that the Reverend Turberville Evans became Vicar. He was a formidable and energetic “Tractarian“ man who ministered at Buckland for 43 years. In 1880 it was decided to double the length of the nave and aisles, but, to do that, it was necessary either to destroy or remove the ancient yew tree at its west end. Sentiment was strongly in favour of sparing the ancient tree, which had long been an object of curiosity to visitors. About the year 1841 “Old Humphrey“ visited this tree, and included an account of it in his "Country Strolls,“ published by the Religious Tract Society, as follows: “I am just returned from Buckland Church; the old yew tree in the churchyard is a curiosity. I wandered amongst the tombs, and mused over such of the green hillocks as had no stone to tell the names of those who slept beneath them; but the old yew tree, after all, was the greatest object of interest. Many an age must that old tree have stood sentinel amongst the graves; sometimes enriched with berries, and always adorned with leaves. At least, I should say, that 500 summer suns and winter snows have passed over it. Grey-haired and bald-headed men, on the Sabbath, have stood beneath it, in the time of barley harvest, before they entered the House of God. Old women, too, have assembled there in their russet gowns, and light-hearted children, on a week-day, have indulged there in pastimes. The tree is hollow, and time and the elements have writhed it into fantastic shapes. I can see, or fancy I see, snakes and dragons in its twisted branches.“ The plea “Spare that tree“ prevailed with the church restorers of 1880, and it was resolved to secure the necessary extension of the church westward, which was to double its length, by removing the yew tree, with its roots and earth, en bloc, to a more westward site. “The operations commenced on Tuesday, February 24th, 1880, when a trench was dug on all sides four feet wide and leaving a large block of earth 18 feet long by 16 feet broad. The trench was made 5 feet deep and a long cutting was formed from the old position to the new one, gradually rising to within one foot of the surface. The large block of earth was then tightly bound on all four sides with planks of timber held together with chains, straw being inserted between the timber and the earth for the purpose of holding the soil together. Wise prophets foretold the discovery of huge roots extending as far as the Chancel of the Church or of an enormous tap root going down 20 or 30 feet into the ground but there were no roots of any size extending beyond or below the block of earth which had been carved out. 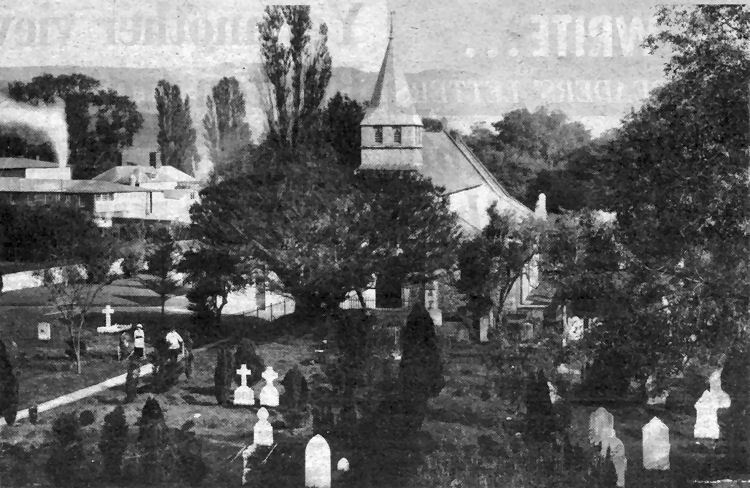 St. Andrew’s Church, Buckland, and the famous yew tree in the churchyard, still none the worse for its remarkable move of nearly 60ft westwards in 1880, a year or two before this picture was taken. The church is shown as extended. Work on enlarging the building began not long after the tree had been moved to allow for the doubling in length of the church. On the left of the picture is part of Buckland Paper Mill. 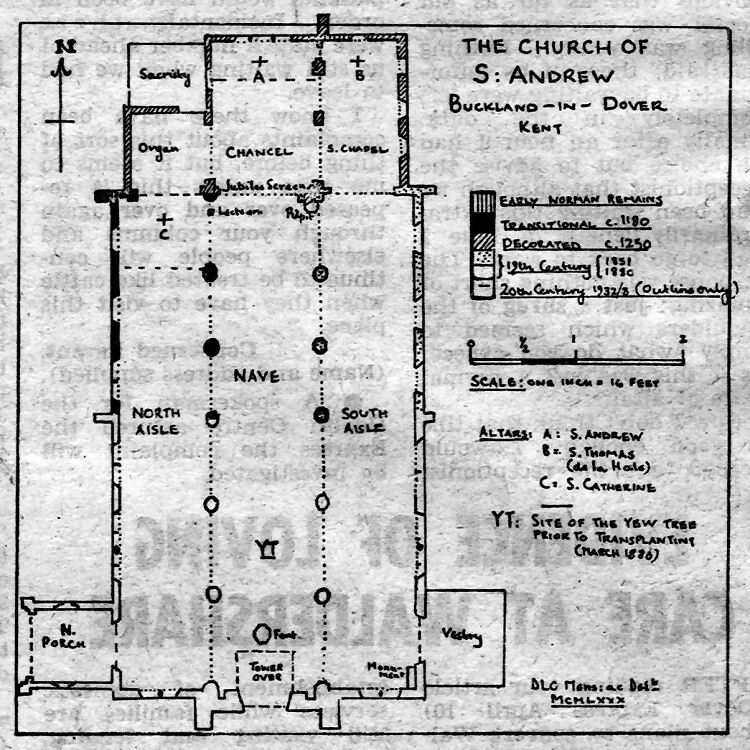 In the 1980 ground plan of the church, above, the letters “YT“ show the approximate location of the yew tree before it was moved.